Allegany County lies in the mountainous western neck of Maryland. Formed from Washington County in 1776, it originally included the present Garrett County, which lies to the west. Garrett County was formed from Allegany County in 1872. A Mennonite congregation, member of the Southwestern Pennsylvania Mennonite Conference (MC), was located at Pinto, a village eight miles (13 km) southwest of Cumberland. This congregation, extending into Mineral County, West Virginia, was organized 27 November 1927. A mission outpost was maintained at Flintstone, a village 12 miles (20 km) east of Cumberland, by the Mennonite churches of Washington County. Miller, Ivan J. "Allegany County (Maryland, USA)." Global Anabaptist Mennonite Encyclopedia Online. 1955. Web. 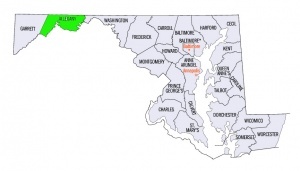 23 Apr 2019. http://gameo.org/index.php?title=Allegany_County_(Maryland,_USA)&oldid=132572. Miller, Ivan J. (1955). Allegany County (Maryland, USA). Global Anabaptist Mennonite Encyclopedia Online. Retrieved 23 April 2019, from http://gameo.org/index.php?title=Allegany_County_(Maryland,_USA)&oldid=132572. This page was last modified on 11 August 2015, at 12:50.